Oliver has always paid the price so that his team would stay safe — so that their souls would be clean and his would be darkened. But what happens when Oliver and Diggle are forced to watch the two people they love darken their souls? That’s what “Dangerous Liaisons” is really about, at its core: the struggle between protecting the person you love and being forced to watch them take a step onto a dark path because you can’t and don’t want to control them. Usually storylines with this subject matter on Arrow frustrate me because Oliver tries to be in control of everyone and the enforcer of their decisions. But this week, we got to see Oliver take a more passive and tactful approach to Felicity, which was very appreciated on my end. I think that this episode did a pretty good job of setting up the rest of the season, and focused just enough on Adrian Chase that it wasn’t overwhelming (even if he was the driving force behind the decision-making). So let’s take a little bit of a deeper dive into the way this episode pitted some of our characters against each other. When Helix discovers that there’s someone inside of ARGUS who is working for Chase, Alena makes the executive decision to do something about it. She goes a little too far by manipulating the elevator that he’s in, and ends up killing him. But it turns out that’s not all that Alena needed this double-crosser for: she wanted a key card from him. And she doesn’t just need one — she needs two. You see, unbeknownst to everyone apart from Helix and Lyla, ARGUS is holding former Helix captain Cayden James at a black site (you know, on U.S. soil). Rather than try Cayden for crimes that ARGUS claims he’s committed — Lyla says that he’s extremely dangerous and could do a lot of damage — they’ve locked him up and are keeping him in essentially the Arrow equivalent of Red’s box on The Blacklist. Just less fancy. And with restraints. Alena needs the two keys to free him and convinces Felicity to embark on the extraction mission with her. As all of this information begins to unravel, Diggle is having a harder and harder time convinced that his wife is doing the right thing. In fact, he tells Lyla that she’s beginning to resemble Amanda Waller in her decision-making. Lyla uses the excuse that from the outside perspective, Waller looked to be a terrible person. But it’s different when you’re on the other side of the desk. Diggle has no idea what that means, but I do — it’s the central theme of our episode: the fact that we can justify a lot to ourselves and end up becoming convinced we’re doing the right thing. Lyla tries to convince Diggle that while her methods were unorthodox, she’s making the world a safer place because of it. And there’s this scene toward the end of the episode where Lyla flat-out tells Diggle that looking around at the world, things have gotten worse. It’s hard to argue with her as we, the viewers, examine our own world. There are horrible things that happen every day and we wish we could do something about them. Lyla is arguing that she is — she’s helping the world become safer. But Diggle makes a really great point in that there’s a distinct difference between something being safer and something being BETTER. Sure, Lyla might be making the world safer by extracting criminals and placing them in black sites. But is she making the world better by doing that? Is she making herself better? Or is she slowly and inadvertently becoming as meticulous, unfeeling and justified as Amanda Waller once was? Because there had to be a point in Waller’s life where she slowly made one decision that pushed the boundaries. And then another that pushed things further. Diggle’s argument (and really the argument of the episode) is that when you’re justifying your limits to yourself, it’s easy to push further than you normally would. But soon you’ll find that the more you push, the easier it becomes to justify things you would never have justified three months ago. Lying to ourselves is one of the things we’re best at, as human beings. And though it’s painful to watch Diggle and Lyla go through this experience together because it’s what broke them apart before, it’s really assuring to know that Diggle isn’t leaving or running away. He’s fighting his hardest to tell Lyla who she is and who she’s destined to become if she doesn’t think about the implications of her actions. And that brings us to the next part of our story. Next week’s episode will feature these two characters solely, from what I hear, so I feel like “Dangerous Liaisons” was set-up for that, and the episode worked really well by contrasting Oliver’s journey with Felicity’s. As I mentioned above, Alena asks for Felicity’s help in finding the one ARGUS agent not yet in a safe house and retrieving her key card. Felicity agrees, because if the crew rescues Cayden James, he has the tech to locate someone based on their heartbeat. That means that Felicity will be able to find out exactly where Adrian Chase is hiding. At the same time, Lyla asks Team Arrow to protect this ARGUS agent as she’s on her way toward a safe location. And this is where Team Arrow and Team Helix collide. Helix’s motorcycle gunmen chase down the vehicle the ARGUS agent is driving, just around the time that Team Arrow arrives on the scene. After some scuffles, Felicity frantically tells Diggle that Team Arrow needs to stand down. She has more information than they do about Cayden James, and reasons for needing that key card. Begrudgingly, Oliver listens to Felicity… who then gets chewed out by Lyla for compromising an agent and potentially endangering her life. (Sidenote: I think it’s entertaining that Lyla lectures Felicity about boundaries and pushing limits because of what Lyla is actually doing in the episode.) When Felicity looks to Diggle and Oliver to back her up, she finds they’re both siding with Lyla. In fact, they tell Felicity that she’s crossed a line by aligning herself with Helix — an organization filled with cybercriminals, one of whom just (accidentally) killed a man. Felicity points out the obvious: that they’re the last people who should be talking about crossing lines, since that’s pretty much all Oliver and Diggle (well, mostly Oliver) have done in the last few years. Felicity chastises them for sitting on their hands and doing nothing, while she’s getting real results — no matter the cost. The thing is, “Dangerous Liaison” works because it makes compelling arguments for both sides of this Oliver/Felicity debate. Typically, I’ll unequivocally side with Felicity Smoak. Generally she makes the most logical sense and is able to smack the stupid out of Oliver. But this week, I was surprised to find myself able to rationalize both characters’ decisions. Oliver clearly loves Felicity and always will. And beyond the surface-level frustration he had with Felicity keeping secrets, he’s just flat-out worried about her. And not, thankfully, in a patronizing way (though I could do without Oliver and Diggle thinking it’s their job to tell Felicity what she can and cannot do). It stems from a place of genuine concern. In a heartbeat, Oliver would sacrifice his soul for the sake of Felicity’s. And he has done that, multiple times. Now Felicity wants to do that for him. She’s willing to taint her soul a little darker if it means putting an end to the man who has caused so much darkness. I haven’t been entirely on board the Oliver/Felicity train since last season, but this episode might have helped me turn a corner. I enjoy watching Oliver and Felicity team up, but I like it even more when they’re at odds and have to figure out their relationship. Conflict like this is entirely organic, and is what the show would have been doing all along. Felicity tells Oliver that because he gave up so much for her, she needs to do this — for herself, and for him. But Oliver can’t fathom a world in which Felicity goes dark so he tells her that he can’t let her darken her soul even a little bit for his sake. It’s then that the two are officially at odds, and Felicity informs Oliver that he’s going to have to stop her. Again: I love this! I love the fact that Felicity and Oliver are both sort of wrong and also sort of right. It makes taking sides nearly impossible, and rounds out the characters — this conflict illuminates characteristics that are fundamental in both of these characters. Felicity is, at her core, someone who fights for what she wants and the people she loves. But she’s also a character who is completely underestimated by nearly everyone in her life. That’s why Helix was so important to Felicity — it gave her purpose in a time in which her life felt directionless. And she was adored by the people there. Alena made Felicity feel competent and needed. Because for as much as she is confident, Felicity is also still broken inside: from Oliver’s betrayal and Billy’s death and Laurel’ death and… oh, right. Did we all forget that Felicity is also still technically paralyzed? Without her tech (as we saw in the promo for next week’s episode), she has to return to the pain and frustration she experienced back then — all of it. She has to relive the moment she found out she was paralyzed over and over again. So maybe this is the little bit of control that Felicity has left in her life and is latching onto it and intent on not letting go. For once, Felicity is in charge of her own fate and not letting things just happen to her or the team. If she can find and stop Adrian Chase — if she can be a part of that — then she has some semblance of control in her life. And while Oliver tries to understand, he can’t support her. He can’t watch the woman he loves turn into someone else (something else) and stand idly by. Apart from their conversation in the loft, I think the most telling moment is when Felicity constructs a literal wall of lasers between herself and Oliver. 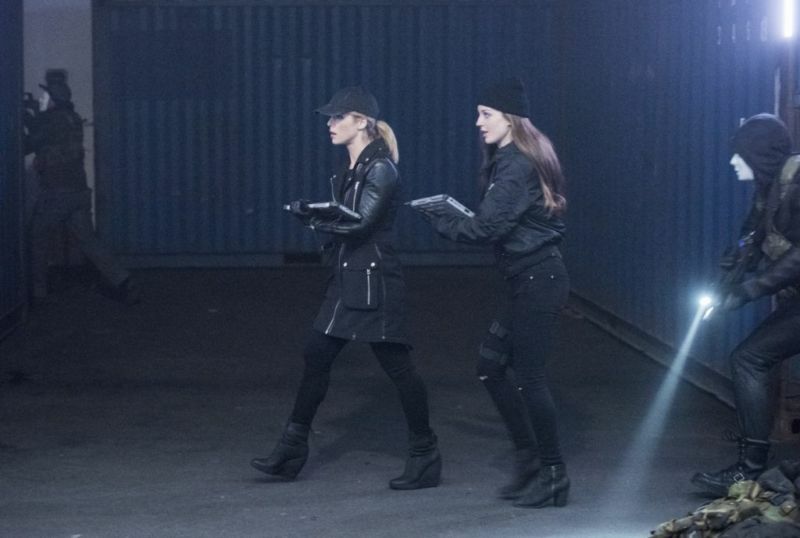 Helix manages to extract Cayden James and in the ensuing chase between Team Arrow and Team Helix, Felicity finds herself at a crossroads. She instructs Alena and the rest of the team to drive Cayden away, and to prevent Oliver from following, she arms the laser wall. It’s the first moment in a long time when we’ve seen a physical manifestation of a personal conflict. There have been walls up between these two for so long that it’s hard to remember a time when they were completely and utterly vulnerable with each other. But in this scene, there is literally a wall between them — and it’s a dangerous one. Felicity doesn’t want to hurt Oliver and vice versa, but it doesn’t matter that Oliver was never physically hurt by the lasers; he was hurt by Felicity’s actions. Again, I think this conflict works so well because the show has refused to paint either party as totally right and Oliver’s concerns stem from a genuine tension of wanting to prevent Felicity from going dark but also realizing he can’t control her. That shows some hefty growth on Oliver’s part. I think that understanding where each character has been, separately, and where they’ve been as a couple helps enforce to me how genuinely in-character their responses are in this episode. Everything felt organic about their debate and about Felicity’s earnestness to help alleviate some of the pressure on Oliver’s soul. While I do think part of that is genuine, I think the layers of complexity in her desire to catch Chase will come to a head in next week’s episode. Felicity might be convincing herself of the reasoning she wants to catch Chase, but there’s a lot more beneath the surface and it has to do with everything that has happened in her life in the last year or so. Oliver doesn’t yell in this episode, which is really refreshing. He drinks alone after Felicity returns to Helix (which is empty, by the way, apart from a video from Alena with a gift — the tech Cayden designed to find anyone based on their heartbeat). But he doesn’t yell. He doesn’t scream. After Felicity makes her decision, he doesn’t really fight her. It’s not that he’s tired, necessarily. It’s that he’s come to the place in his relationship with Felicity that he’s recognized she is her own woman and he wants the best for her. Even if that means watching her walk down a path he doesn’t agree with. But Felicity returns to the Arrow Cave, a bit upset that she’s been abandoned by Helix and convinced Oliver will be happy about it. He’s not, of course, because the last thing Oliver wants in life is for Felicity to feel a sense of abandonment (especially if it’s initiated by him). But as the tech begins to do its work, Oliver and Felicity realize something harrowing when the tech locates Adrian Chase. He’s inside of the Arrow Cave. The episode ends with an explosion, as Oliver and Felicity are thrown backwards. Dun-dun-DUN. Overall, I think that “Dangerous Liaisons” was a really solid episode. The focus was shifted away from Adrian Chase’s evil schemes and onto how those schemes have affected and influenced the decisions that our characters make. And really, whenever Arrow chooses to focus on the characters and their motivations rather than a convoluted plot or absurd villain, the episodes are better. I’ve missed writing Arrow reviews! Especially positive reviews. This is weird but welcomed. There was a sub-plot in the episode that had to do with Rene and Lance (Rene doesn’t want to fight for custody to get his daughter back because he doesn’t believe he’s good for her, blah blah blah). I enjoyed, for the most part, the Rene/Lance interaction. It’s nice to see them find some common ground — both being fathers of daughters — for once. I’ve realized the Canary Cry is boring no matter who does it. There were no flashbacks in this episode and that made my heart so happy. “I got Felicity’s friend.” “I have a name, you know.” I think I will miss you most of all, Alena. Did anyone else find Curtis SUPER irritating in this week’s episode? Usually I find Echo Kellum to be charmingly aloof as Curtis, but his persistence and unnecessary, forceful comedy really didn’t work with the tone of the episode. Fail, writers. I read your article entirely, but I'm french so I may not understand all of it. However, I like it. But what do you personnaly think about Felicity's behavior in this episode and what do you think will happen next ? For me, I would like olicity back. PS : sorry if my english is bad !